The thermal engine or internal combustion engine. Inside the thermal engines we explain the gasoline engine (or otto engine) and the diesel engine). The electric motor. This engine has undergone a great evolution throughout history and right now is one of the most used types of engines and with more projection of the future. We will analyze direct current electric motors and electric alternatif current motors. The steam machine. The steam engine was very important at the time, especially as an engine. Little by little, the thermal motors and the electric motors have been taking away the ground. The steam engine, in the actuality is used especially in its version of electric steam generator in, for example, in nuclear power plants. A thermal engine is an alternative engine that converts heat energy (heat) into mechanical energy. In this sense, the steam engine could also be considered a thermal engine, but due to its special characteristics we will explain it separately. The diesel engine, which operates according to the diesel cycle. The gasoline engine, which works according to the otto cycle. Each of these engines works with a certain cycle, (the diesel cycle and the otto cycle respectively). In this site we will analyze different operating cycles, their characteristics and we will compare them among them. We will study the difference between the real cycle and the theoretical cycle of these engines. In parallel, both types of engines can divide their cycles into times. According to this classification there are two-stroke engines and four-stroke engines. We will explain the characteristics of a four-stroke engine and those of a two-stroke engine. The engines most used today in the automotive sector are one of these two types. The diesel engine is an internal combustion thermal engine. Its main characteristic is in the ignition of fuel. This is achieved by the high temperature produced by the compression of air inside the cylinder. It was invented by Rudolf Diesel in 1895, from which he derives his name. It was initially designed and presented at the 1900 international fair in Paris as the first "biofuel" engine, like pure palm or coconut oil. Diesel also claimed in his patent the use of coal dust as fuel, although it is not used because it is abrasive. The gasoline engine is a type of internal combustion engine. The gasoline engine works according to the otto cycle. The ignition of the fuel is generated by a spark generated by the spark plug. This engine, also called spark ignition engine or otto engine. We define it as a steam engine because it can function both as an engine and as an electric generator. At present, the steam engine is used more frequently as a generator in thermal power plants and nuclear power plants than as a motor. The importance of the steam engine, throughout the history of the steam engine has been losing relevancy due to thermal and electric motors. 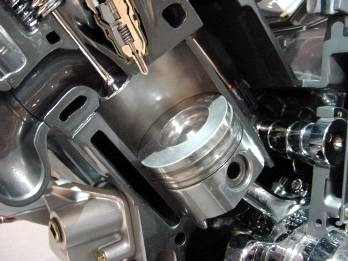 The operating principle is to generate steam and use steam pressure to drive a piston. In this way thermal energy is converted into mechanical energy. Electric motors are those motors that are capable of transforming the electric energy into mechanical energy of rotation. There are those that use continuous electric current and others that work by alternating electric current. The electric motor is becoming increasingly important in the industrial world and above all in the domestic world. It is a clean engine, with a ratio of size, weight, cost and performance to my good. There are many types of electric motor that can be distinguished between direct current motors and alternatif current motors.